If people know just one thing about Armenia, they know that this was the first Christian nation. The traditionally accepted date of Armenia’s adoption of Christianity as state religion is 301 AD. It is a big part of Armenia’s self-image that this country led the way in the official acceptance of Christ’s teachings. In recent years some scholars have made a tentative case for Ethiopia having precedence — they have cast doubt over the accuracy of the Armenian date of 301. It would make some Armenians cross if scholarly opinion ever conclusively deprived them of the title of first Christian state. But there is a question that interests me more than who came first. It is this: how was Christianity spread in the early centuries? After arriving in Armenia, I realised with a start that I knew little about the first centuries of the world’s most important religion. I chiefly had in my head the image of the early Christian as martyr, cruelly fed to the lions by the Romans. But in Armenia I was suddenly confronted with the image of early Christian as warrior, waging a religious war against pagans. One secondary source on Armenia’s history is Yuri Babayan’s English-language website armenianhistory.info. Now there is nothing in the Sermon on the Mount, of course, about the need to smite the heathen with fire and sword. This bloodletting happened 17 centuries ago, but still I find it more than a little disappointing. It is surely not what Jesus Christ had in mind. King Tiridates had, in theory, accepted a gospel of love. 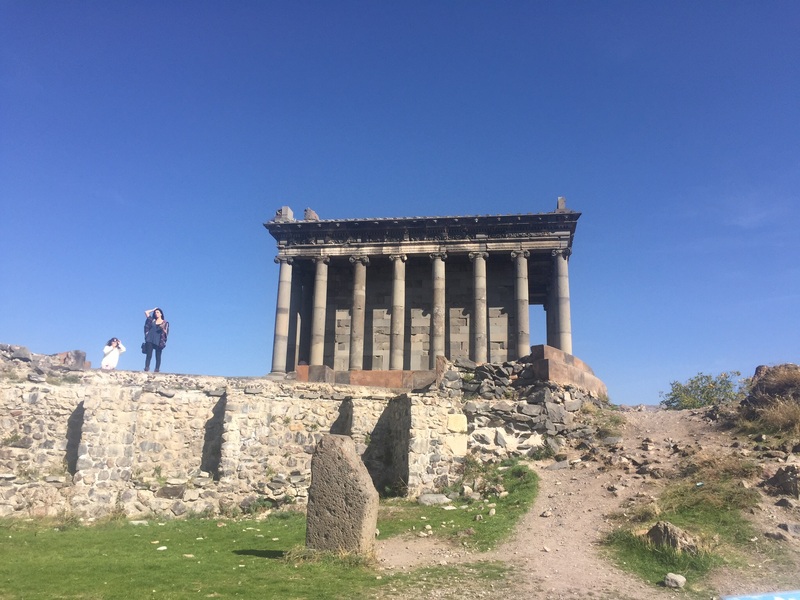 I went to the temple at Garni, on a day trip out of Yerevan. It was a welcome change from the big city. In a taxi we drove along nearly empty roads up into the mountains. The sun shone, the trees were in their autumn colours and the great white majesty of Ararat dominated the view off to the southwest. Garni was built on the edge of a cliff in the second half of the first century AD and is mentioned in the Annals of Tacitus. It is the only Greco-Roman style colonnaded building anywhere in the former Soviet Union. Dedicated to the sun god Mihr, it was built by an Armenian king following rules of sacred geometry. The most sacred numbers were three, six and nine, the last being the holiest number of them all. Today Garni is one of Armenia’s most popular tourist attractions. What visitors see is essentially a reconstruction, completed in the mid-1970s. The temple is also the main shrine for a small number of neo-pagans, who tap into Armenia’s pre-Christian beliefs which King Tiridates did not root out. They come here for ceremonies particularly on March 21, the pagan New Year. From Garni we drove on a few kilometres to one of Christianity’s holiest sites in Armenia, Geghard monastery. This is a place of great tranquillity and beauty. In the summer months many visitors come, but in October it retained the feel of a sanctuary, a retreat. 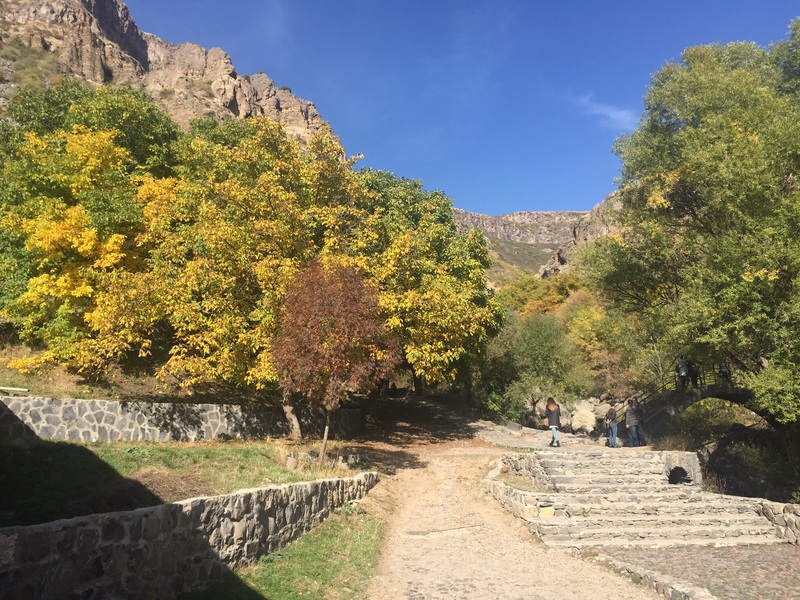 Geghard, the Monastery of the Holy Lance, stands near the head of a valley with tall cliffs on three sides. It has been a site of Christian worship since the fourth century when St Gregory the Illuminator, who converted King Tiridates to Christianity, founded a monastery complex here. Some churches within the complex are dug out of the cliff face. The monastery gets its name from the fact that for centuries it kept the lance which Christians believe pierced the side of Jesus when he was still nailed on the cross. The day before my pilgrimage to Geghard monastery I went to Echmiadzin, about 20 km to the west of Yerevan. This is Armenia’s Vatican and it was the capital of the country when Christianity became the state religion. According to tradition, St Gregory was divinely guided to build the first Mother Church of Armenia (Mayr Tachar) in Echmiadzin on the spot where a beam of light fell. Building took place in 301-303. The original structure fell into ruin and successive building took place at later periods, but Echmiadzin cathedral is considered the oldest in the world. Right now it is having a bit of a facelift. In its treasury is the Holy Lance, set in a gold and silver casing, which was once at Geghard. The treasury also has what it describes as fragments of Noah’s Ark. According to the Book of Genesis, Noah’s Ark came to rest on a mountain in the Ararat range, which is clearly visible from Echmiadzin. Armenians consider themselves to be direct descendants of Noah. 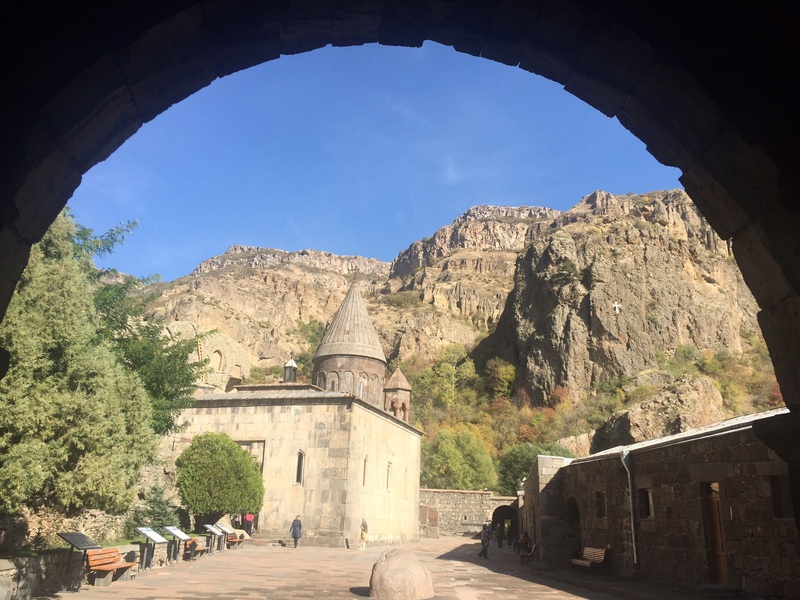 I travelled to Echmiadzin on a Sunday and the city was buzzing with life. 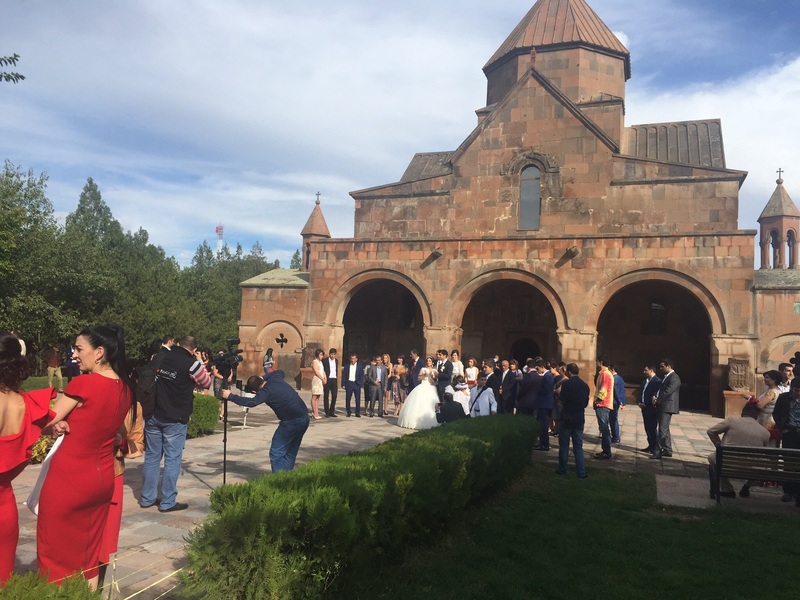 At the Surp Gayane church a succession of weddings was taking place. Just outside the church were several violinists and a white Rolls-Royce. So where do Armenia’s posh neo-pagan weddings happen? At Garni Temple, of course.